I typically buy my books from Amazon... way too many of them, but I digress. During a discussion the other day, the subject of Python (the programming language) came up and since I don't know Python I thought I'd see what I could find to learn more about it. I searched online and found a few good sources, however, I tend to learn best from books. I went to Amazon and found a couple of books... realizing I didn't want to wait for a book to arrive in the mail (and paying for overnight shipping erases any potential savings from Amazon) I decided to check to see what was in stock at my local Borders. 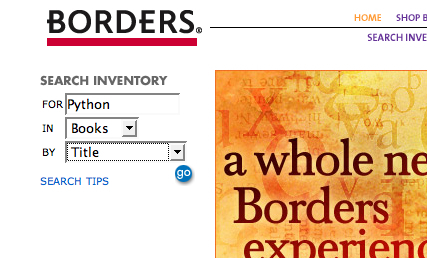 First, kudos to Borders for having store inventory on their web site... I can tell it which stores are close to me and it will show if a book is in stock at my stores. I love that feature. The downside is that the rest of the site leaves a little to be desired. I went to the site and typed in Python in the search area. What I got back was less than helpful. A generic list of books with Python in the title. Okay, so the list is easy to get through, but it doesn't help me sort the list in any way. The physical store has books arranged by category, why can't they carry this through to the website? They have shelf information on the site - can't they use that to correlate the other books in the same category? Also, since they have store information on the page, can't they just offer me the ability to just see the books that are on the shelf in the store at this time? The final item would be leveraging the Return to Prior Work pattern. As I'm browsing books (or any other item), let me get back to previously viewed items quickly and easily (Amazon does this). None of this would be hard to do. They have all the data they need. I heard an interesting tidbit the other day when I was talking to someone about Web Analytics. They said that Circuit City, which also offers "Reserve for In-Store Pickup" via their web site, measures what additional sales that occur from people who purchase online and pick it up in the store... they can tell how many CD's people buy, for example, when purchasing an MP3 player through the site. I'm sure that Borders can does some type analysis to determine the payback on this. 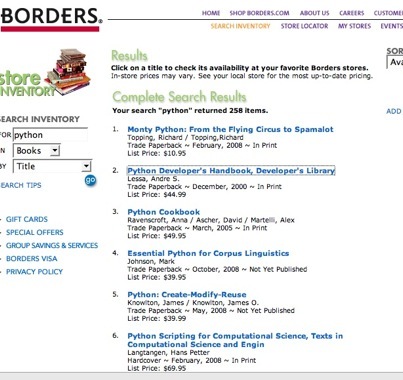 Having worked on plenty of BI and web analytics systems, I am sure that Borders is collecting the relevant data. Itś just a matter of building the analytic tools to get the answers to the key questions. Well, considering Borders put itself up for sale in March, I doubt this is on their list of priorities . . .
1) They spent a boatload of money only two years ago rolling out their "Borders Rewards" program (including new website design!) but there must not have been enough to implement your suggestions, which I don't doubt were raised by someone. 2)The idea to only show books currently available at the store would be detrimental to sales and customer retention because their system inventory typically does not reflect what is actually on the shelves. As a former employee, I recall looking up a book for a customer in the inventory system and finding that the store had -15 of that item. Yes, their inventory was in the negative. Or it would say 0, and I would find a dozen on the shelves. Honestly, when you find yourself in such a situation again, it's easiest to do your browsing on Amazon (with the good search engine) and find a couple of books you like, then check the Borders website for specific availability, then call the store or request to reserve the book online. However, I can't promise that they'll be able to find it for you, because the inventory may be wrong! p.s. I still like Borders, I'm just well aware of the store's shortcomings.